Research on sterols has been underway since the 1920s. 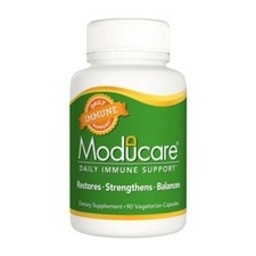 Studies using Moducare® have been conducted in those people with rheumatoid arthritis, HIV, general immune function, TB and stress-induced immune suppression. Research has shown quite clearly that the blend of sterols and sterolins, in a 100:1 ratio as found in Moducare®, exhibits the best immune balancing activity. Double-blind, placebo-controlled studies on Moducare® have been published in international medical journals. Other ingredients: Rice flour, magnesium silicate, vegetable cellulose, water, vegetable glycerin and silicon.